As the entries for the 2012 29th National Aboriginal and Torres Strait Islander Art Awards come under the scrutiny of the Awards' pre-selectors, so the key staff who are responsible for the Awards are departing. Specifically, Natalie Merida, the experienced co-ordinator of the Awards for at least a decade has already left to work with the Aboriginal Areas Protection Authority. 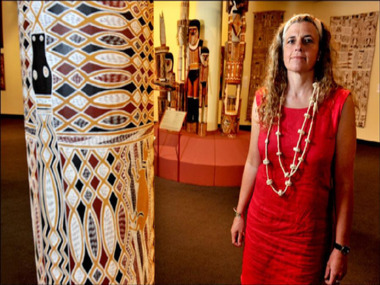 And, immediately after pre-selection, Dr Christiane Keller, Indigenous Curator who took up her job just before the 2011 NATSIAAs, will resign. No reasons have been offered for these departures. But a new Director for the Museum and Art Gallery of the NT – Pierre Arpin – has arrived since the 2011 Awards; and amongst his achievements in the past was the rescuing of a museum in Vancouver which was on the brink of insolvency, causing him to initiate immediate staff lay-offs. Two years later, the finances were back in the black. A national search will be started to replace Dr Keller – but it's extremely unlikely that her replacement will arrive before the August 10th opening of this key event in the Indigenous art calender – sponsored by Telstra. In the meantime, Ms Merida has been replaced by Alison Cowan, who has not been involved with the Awards before. It always seemed strange that these quintessentially Australian Indigenous awards should be entrusted to the joint management of a French Canadian Director and a German-born Curator. Arpin may have a 33 year-long career and to have worked most recently at the NGV in Melbourne. But when asked about the origins of art on the radio, he instinctively referenced hand stencils on cave walls at Altamira in Spain rather than the more relevant Aboriginal equivalents. So the optimistic claim of the NT Government spokesperson that “the Senior Management Team of the MAGNT are well apprised on all aspects of the Telstra/NATSIAA and will ensure its successful delivery as we have for the last 28 years” would seem to be mildly hyperbolic! Meanwhile, pre-selection goes on in the hands of Glenn Iseger-Pilkington – Curator Indigenous Art at the Art Gallery of WA – who surely has a conflict of interest with his curation of the 'rival' WA Indigenous Art Awards; Prof Roger Benjamin – Professor of Art History at the University of Sydney, and controversial curator of the Icons of the Desert exhibition in America in 2009; Bindi Cole – award-winning Indigenous photographer from Victoria; Gordon Pupangimirri – Sculptor and Executive Member of the Tiwi Design Aboriginal Corporation; and Dr. Christiane Keller from MAGNT. The results of their deliberations will be announced on May 1st – all being well.